Daily Illuminator: Ogre, Munchkin, GURPS, And More For Cyber Monday! November 27, 2017: Ogre, Munchkin, GURPS, And More For Cyber Monday! Today is Cyber Monday, that special "holiday" where we rush to the Internet to take advantage of special offers on everything from books to films to socks to, yes, games. In celebration of this day, we thought it was a good idea to list all of our fantastic offers for those who are looking for more Ogre, Munchkin, and GURPS to add to your game collections (or to give as holiday gifts). Ogre Miniatures Set 2 – The Kickstarter project closes today, so this is your chance to grab hundreds of miniatures for only $75. Do you want over 1,000 Ogre plastic miniatures? Well, there's a reward level for that! For those outside of the U.S., Warehouse 23 has preorders open for Ogre Miniatures Set 2 and the Ogre Miniatures Set 2 Many Minis package. Munchkin Collectible Card Game Preorder – The new Munchkin CCG doesn't launch until late February, so we have opened up a limited-time preorder offer for all three starters, a dozen boosters, and a holiday greeting card. We'll drop the card in the mail before Christmas so you can show your favorite Munchkin opponent that you can't wait to destroy them at a new game . . . or keep it for yourself! We won't judge. Munchkin Gift Pack – We understand. You're pressed for time and need a little help with wrapping presents. This special pack of three pre-wrapped Munchkin games makes your holidays easier when you slap on a gift tag (included!) and give the games to your friends. And if you keep the five new game cards for your collection . . . well, it's what Spyke would do. He might even use the included greeting card to gloat about it. Munchkin Holiday Grab Box – Over $100 worth of Munchkin loot in a single $60 box! And since it is all sealed up and ready to go, all you'll need to do is slap your own greeting over the mailing label and surprise a friend with an instant Munchkin collection. And if this box isn't enough to cover the greed of the holidays, we have an even bigger box available. GURPS Archive Mystery Bundle – We recently cleaned our product archives, pulling out extra copies of various GURPS books that date back to the launch of the game in the '80s. Rather than toss the excess books, we constructed the GURPS Archive Mystery Bundle, over $60 worth of GURPS for only $30. No two bundles are identical, and the books inside date from the last 10, 20, and 30 years! This would make a good gift, but we won't tell if you pull a book or two from the bundle for your own collection. In addition to all of those deals, Warehouse 23 is holding a sale on select items until the end of this month. 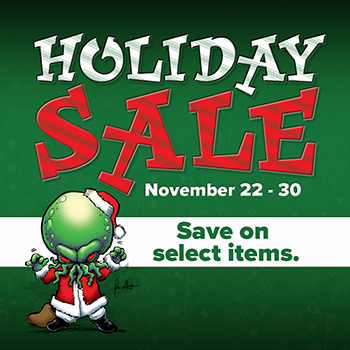 Click here for the full sale list, and then get ready to play Santa and spread gaming cheer to all of your friends and family for the holidays!